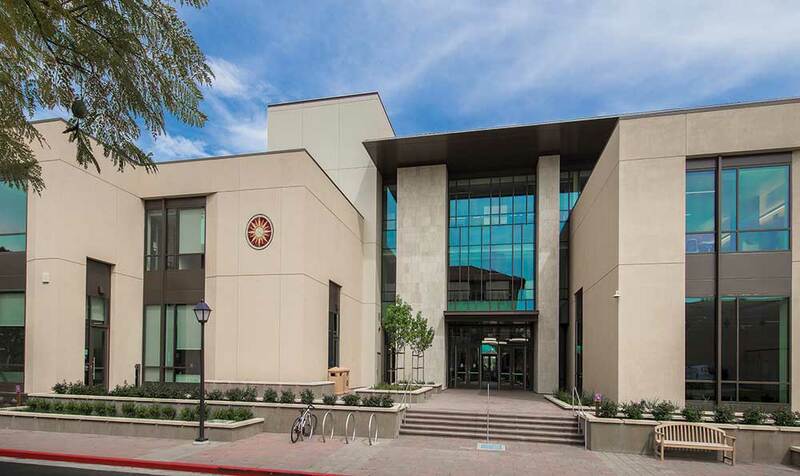 On March 5, fewer than 600 days after breaking ground, Santa Clara Law began moving into its new home, the Howard S. and Alida S. Charney Hall of Law. This dream of a new building for the Law School became a reality thanks to a $10 million lead gift in 2014 from trustee and alumnus Howard Charney MBA ’73, J.D. ’77 and his wife, Alida, as well as the generous support of hundreds of alumni, friends, law firms, businesses, and community members of Santa Clara Law. Panetta Plaza is a major outdoor plaza named for Leon E. Panetta B.A. ’60, J.D. ’63, and his wife, Sylvia, who have been longtime supporters of the school. Located at the south entrance to Charney Hall near the gateway to the SCU campus, Panetta Plaza will serve as a prominent outdoor location for large Law School community events. Collaboration and connectivity are two strong themes that resonate throughout the building. The building’s location, adjacent to Lucas Hall and the home of the nationally known Leavey School of Business, and Vari Hall, home to the respected Markkula Center for Applied Ethics, places Santa Clara Law squarely in the campus’ professional neighborhood, and will encourage interdisciplinary collaboration among students of business, law, technology, social justice, and ethics. The 96,000 square foot, eco-friendly building will serve up to 650 J.D. and 100 non-J.D. students. With flexible learning spaces and sophisticated classroom technology, Charney Hall will help Santa Clara Law continue to evolve its programs and offerings to keep pace with changes in the legal field, while continuing to support a high-achieving student body and attract exceptional faculty. The Mabie Grand Atrium greets visitors as they enter Charney Hall through the south entrance. The two-story space features bright lighting, clean lines, and multiple gathering spots for students. This space was named in honor of the William and Inez Mabie Family Foundation through the generosity of Ron Malone J.D. ’71 and his wife, Sara. Top: Albanese Alcove is the west entrance to Charney Hall, connecting the Leavey School of Business and the Markkula Center for Applied Ethics to Charney Hall. From here, visitors can access Law Clinics and the Enrollment Management offices, and reach the Fremont Bank Concourse. Left: The law library includes 4,300 square feet of stacks and a large reading room with new technology-based research capabilities. In addition to more than 80 study carrels throughout the space, the library features multiple collaborative study spaces, including booths, tables, and high tech conference rooms with LED screens. Throughout the new building, there are numerous cozy corners, couches, tables, benches, and conference rooms for students to gather, collaborate, and study together. And of course, the technology in Charney Hall is cutting edge, from numerous LED monitors to smart keys for classrooms to an Artificial Intelligence Lab. comfortable couches for informal meetings, and a beautiful outdoor terrace. Left: In the Mabie Grand Atrium, there are plenty of gathering spaces for students to collaborate, study, and relax.